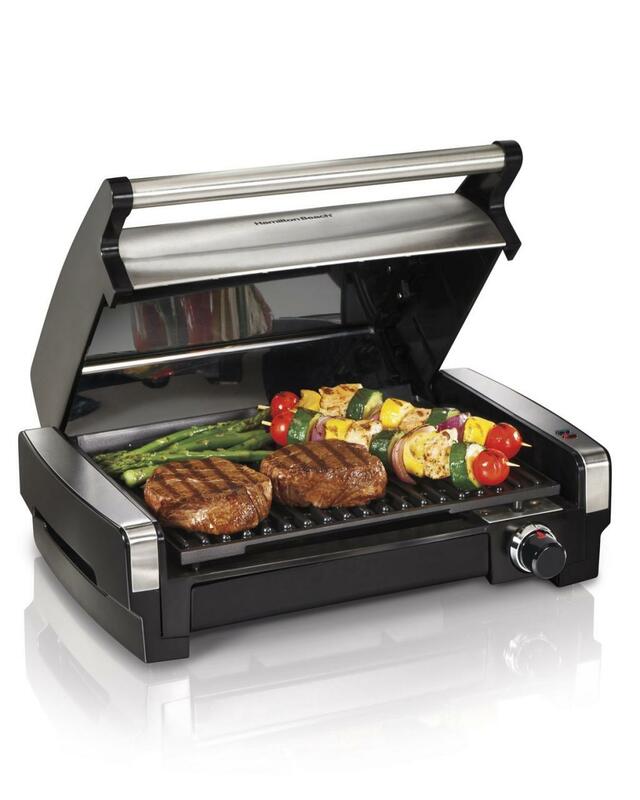 Electric grills are gas-free, charcoal-free grills. Most electric grill models use a hot metal coil that heats the grilling space–and the food on top of it–when electricity passes through the coil. They do not feature an open flame, which helps protect against unfortunate grilling accidents. Many grill purists argue that electric grills don’t produce the same authentic flavor you expect from food cooked on a traditional outdoor grill, but these modern grills come have many distinctive advantages that gas and charcoal grills do not. One of the main draws of electric grills is that most electric models can be used both inside and outside. Gas and charcoal grills emit dangerous, noxious fumes and produce too much smoke to be used inside without causing a fire hazard and a smelly, smoky mess in the kitchen. Electric grills, on the other hand, produce minimal smoke and no deadly carbon monoxide. In the long run, electric grills also cost less money than charcoal grills or gas grills because they don’t require any fuel other than an electric socket. 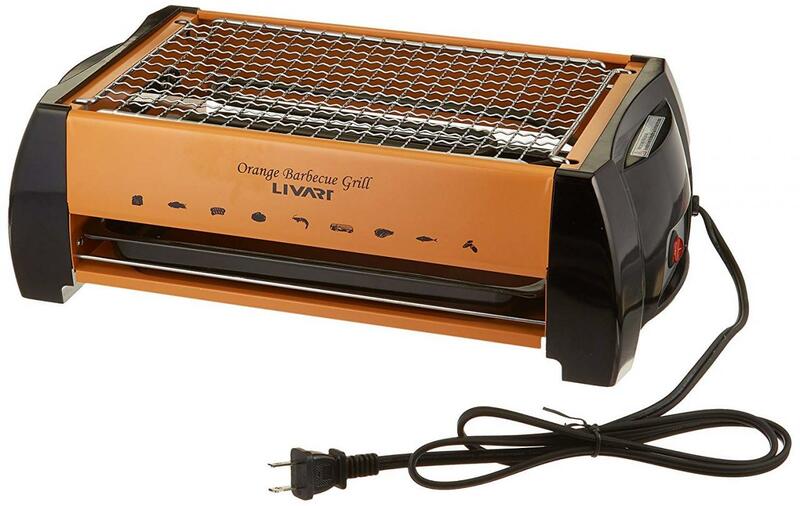 Overall, electric grills are cost-effective, convenient, and easy and safe to use. If you want to go electric and change the way you grill your food forever, check out these five top-quality electric grills. The 240 square inches of grilling space this electric grill provides gives you room to cook up to fifteen servings of food simultaneously, allowing you to easily accommodate large groups while camping or hosting a barbecue. Once you start cooking, it’s easy to maintain control over the grill’s temperature to guarantee delicious, evenly-cooked food every time. An adjustable temperature probe built into the grill allows you to choose between five different heat settings, making expert temperature control easier than ever. This grill is easy to use and easy to clean. Its surface is covered with tough, nonstick coating. This coating increases the durability of the grill, makes it easier to clean, and adds convenience to the grilling process by eliminating the need for added butter or oil. It also includes a convenient drip tray that is dishwasher-safe for fast and easy post-grilling clean up. Versatility is another advantage of this circular electric grill. You can use it safely both inside and outside. It comes with a removable stand that allows you to set it up on its own outside or place it on a countertop in the comfort of your kitchen. Smoke should be the last thing on your mind when you’re cooking a meal on this grill from the comfort of your own kitchen. The smokeless electrical grill delivers the high-heat searing power of a traditional outdoor grill, but produces no smoke and can be used safely inside. Cook your food evenly and lock in flavors every time for a juicy, flavorful finish using this grill’s adjustable temperature control. You don’t have to be an expert outdoor cook to get delicious results. Even novice grillers can grill up delicious meals on this grill, with its clear indicator lights and simple temperature adjustment. Plus, the grill’s plate is dishwasher-safe and non-stick, so you don’t have to worry about scraping bits of stuck food off its surface. When you’re done grilling, just slide out the grates and removable extra-large drip tray and stick them in the dishwasher for effortless clean up. Crafted from porcelain-enameled cast iron, the cooking grates of this grill are very durable and cook your food evenly every time. The grill’s nylon frame is reinforced with glass and aluminum liners for superior heat retention. Its lid and body are made from cast aluminum, which is also extremely durable and easy to surface clean. Its removable catch pan makes clean up even easier. All excess fat and drippings fall down into the pan while you grill. When you’re done cooking, just slide the catch pan out, wash it, and replace it. 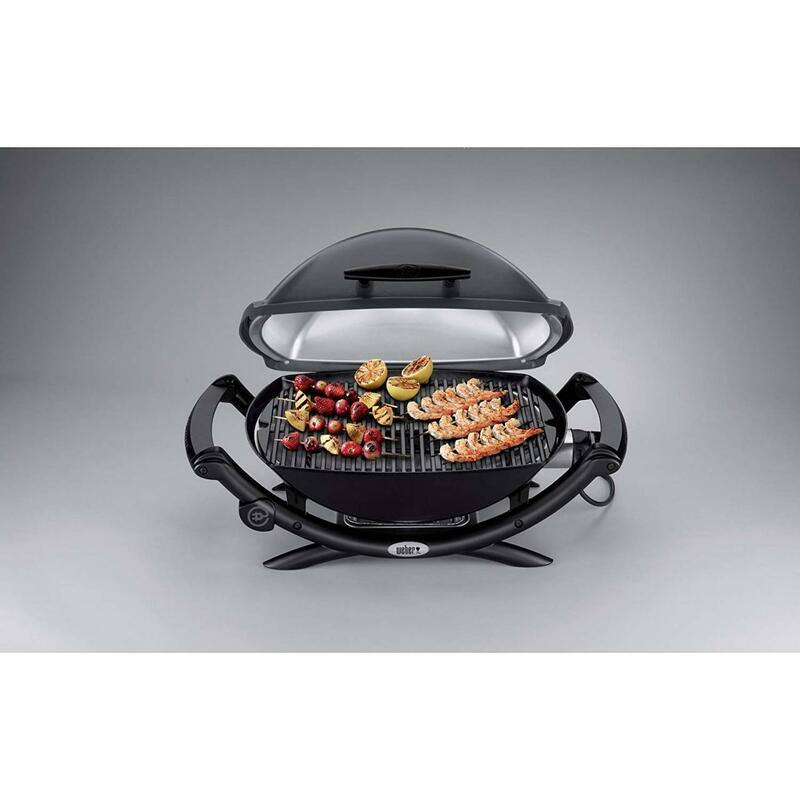 The frame of this electric grill is extremely compact, which is ideal for indoor and outdoor grilling. Its attached 6-foot cord and small, lightweight body gives you the freedom to grill easily wherever you go, whether you’re camping or hosting a cookout in your own backyard. You can cook up to twelve hamburgers at a time on the 240-square inch grilling surface of this electric grill. This grilling surface is crafted from high-quality cast iron and enameled with porcelain for maximum durability and high performance. It uses an electric infrared cooking system that heats food evenly all the way through and locks in flavors for delicious, juicy, flavorful results. Monitor and control heat throughout the cooking process with the grill’s built-in simple temperature control knob. After you cook your food but before you’re ready to serve it, you can use the grill’s 80-square inch warming rack to keep the cooked food warm before you bring it to the table. Two side shelves are built into this electric grill to give you room to prep your food and store your grilling accessories nearby while you cook. These shelves are easily foldable to take up less room inside or outside when the grill is not in use. The grill itself is also easy to store. It features attached wheels for maximum portability. When you’re done grilling, cleaning up is never messy. The grill features a porcelain-enameled removable grease tray that catches all of the grease while you cook. Just pull the tray out from the front of the grill, wash it, and replace it. Designed specifically for skewer-style cooking, this compact electric barbecue grill makes prepping your favorite food on a stick faster, easier, and more hands-off than ever before. Its grilling rack is built in a pattern of 1/2-inch squares that prevent small pieces of food fro falling through the cracks of the rack while you grill. Although it is ideal for skewer-style cooking, the grill is built to cook food that isn’t on a stick as well. 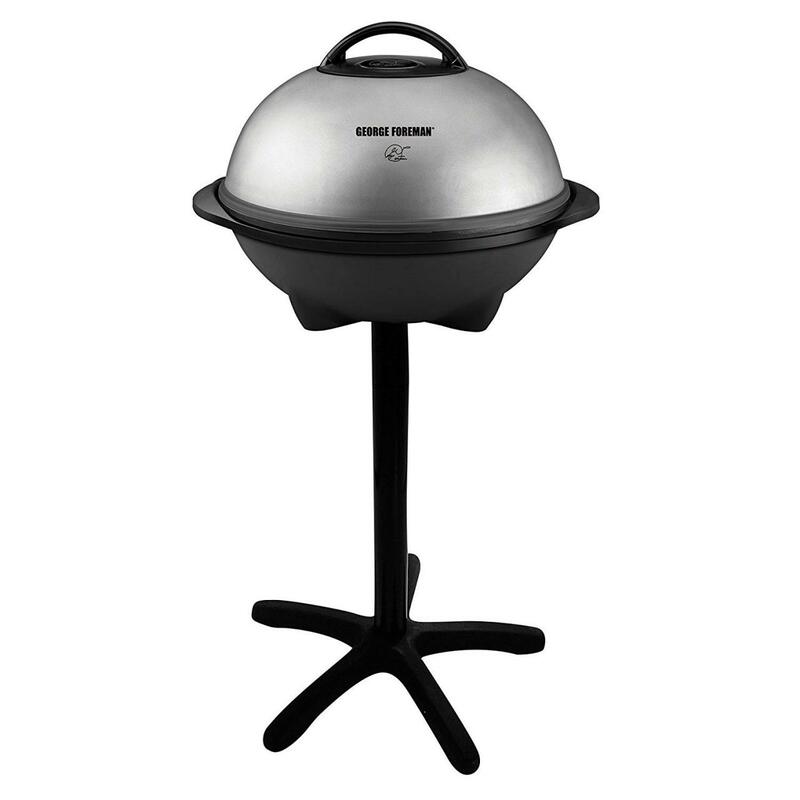 Its height is easily adjustable to make room for full-sized pieces of meat, including chicken, steak, and burgers. Cleaning up this grill couldn’t be easier. All the drippings and fat from the meat you cook falls directly into a bottom tray underneath the main body of the grill. Just slide out the bottom tray and dispose of the residue inside it. 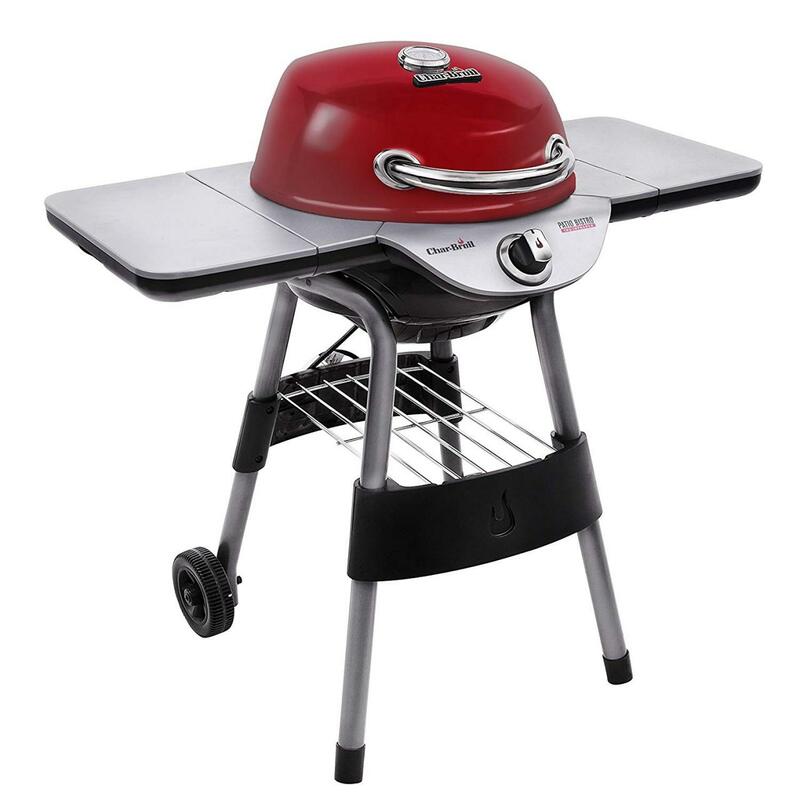 The stainless steel grill body is also detachable and is very easy to wash or surface clean. 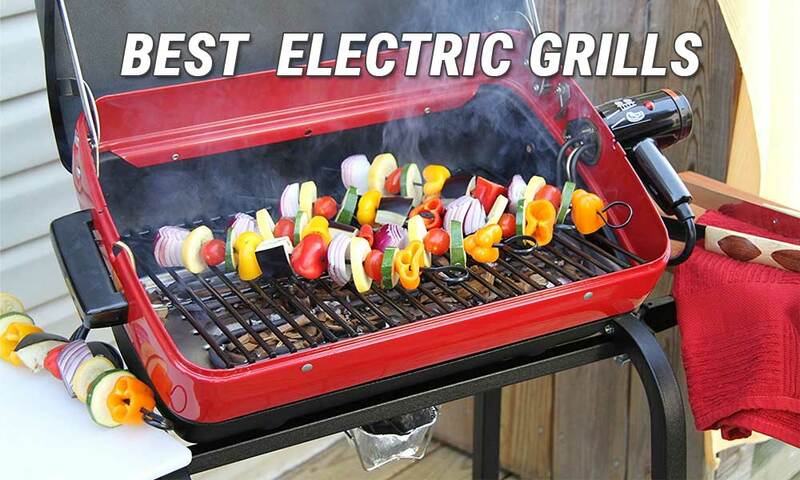 Make your grilling experience easier, safer, and hassle-free with an electric grill. Try out any of these five top-rated electric grills to find the model that meets all your outdoor–and indoor–cooking needs. If you’re tired of waiting for your grill to heat up or struggling to grill your food evenly, check out these five top-rated propane grills to streamline your grilling process for delicious, evenly-cooked food every time.